“Heeeeyyyy, baby! It’s the Fourth of July!” Happy Independence Day to those who celebrate it. One year ago today we began our quest with a tour of the Gowanus Canal and its bridges. This morning we started our trip up the Hudson River, our way of commemorating the 400th anniversary of Henry Hudson’s voyage. The river ahead of us is quite different from the river that was ahead of Henry. Yet in many ways it probably hasn’t changed all that much. 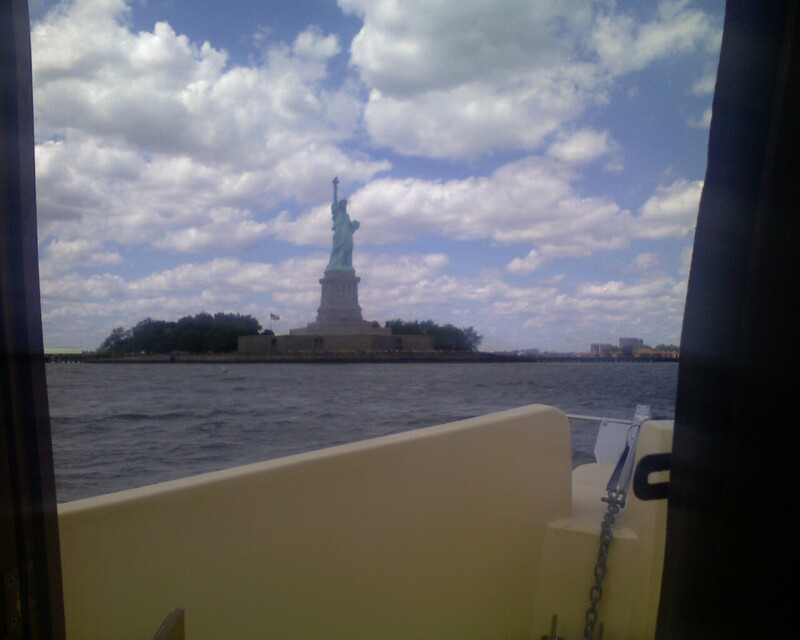 After a bumpy ride into New York Harbor, we paid our respects at the Statue of Liberty, stimulated the economy by buying fuel in Jersey City, and docked for the night at the 79th St. Boat Basin. We are now preparing to do some serious relaxing and watch some fireworks tonight. Amidst all the fireworks and John Philips Sousa music, let’s not forget what an incredibly novel idea liberty was when Adams, Jefferson, Franklin, and the others proposed it 233 years ago.